With the melancholy open-road epic Two-Lane Blacktop, American auteur Monte Hellman (The Shooting, Cockfighter, and the recent Road to Nowhere) poeticised the beautiful, terrible rootlessness of his nation in the era of Vietnam. Funded by Universal in a bid to recreate the success of Easy Rider – by giving a number of filmmakers $1m and final cut – Hellman’s effort is now regarded as one of the key films of the New Hollywood renaissance of the early 1970s. While driving eastward on Route 66, two rival car owners – The Driver (singer-songwriter James Taylor) and The Mechanic (Dennis Wilson of The Beach Boys) in a souped-up, drag-racing ‘55 Chevy, and a middle-aged braggart (Warren Oates) in a gleaming GTO – begin to race for each other’s “pink slips” and the affections of the listless female hitchhiker (Laurie Bird) who joins them on the road. 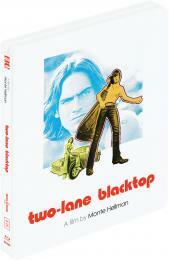 Scripted by esteemed novelist Rudy Wurlitzer, and featuring the only screen performances of Taylor and Wilson, Two-Lane Blacktop remains a timeless, existential portrait of lives in transit and of a country questioning its identity. 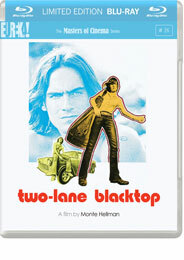 The Masters of Cinema Series is proud to present Hellman’s iconic film in a director-approved Blu-ray special edition. 36-PAGE FULL-COLOUR BOOKLET featuring a new essay by critic Brad Stevens, and a vintage piece of reporting from the set of Two-Lane Blacktop by Shelley Benoit.